One of the most fun decks to come out of Sun and Moon was Solgaleo GX/Lurnatis GX. For those not familiar with it, the deck started off as an Elite Trainer Box deck. In Elite Trainer boxes there is a book that comes in them, which have the entire setlist, and then also goes over some deck ideas that come from the new set. The general assumption is that former player and current commentator, Kyle “Pooka” Sucevich, who currently works for Pokemon is the one responsible for writing the material for these books, although no one knows for sure. For Sun and Moon, one of the deck ideas presented in the book was Solgaleo GX/Lurantis GX. The idea behind the deck is to use Solgaleo GX’s Sunsteel Strike attack for powerful OHKO’s, and then recharge its Energy with Lurantis GX’s Flower Supply, switching back and forth between the two. As Solgaleo GX discards all of its Energy with Sunsteel Strike, it needs to constantly be recharged. After the deck idea was spread on social media, no one really took it seriously, except for Ahmed Ali, who cooked up a list for the deck. Based on Ahmed’s early use of the deck on PTCGO, Jose Marrero wrote an article on the deck prior to Anaheim Regionals. Headed into Anaheim Regionals, the deck still was very much considered a joke deck. However, Drew Kennett, who has been one of this season’s best players, chose to play the deck for Anaheim and actually took it all the way to a 14th place finish. This is the only success the deck has seen at a major event, but it has seen some success at the local level. The biggest problem with the deck is that it is playing a Stage 1 and a Stage 2 line, which makes it very inconsistent. However, Guardians Rising comes up with some solutions to this decks problems. The big new addition is Rayquaza, which is able to accelerate two Basic Energy cards from the discard pile to one of your benched Pokemon. The big thing Rayquaza has going for it is that it’s a Basic Pokemon, so this instantly replaces Lurantis GX in the deck. No longer is this deck Solgaleo GX/Lurantis GX, but now it is Solgaleo GX/Rayquaza. Making the change from Lurantis GX to Rayquaza opens up additional spots in the deck which can make it more consistent as you have more spaces to devote to the deck getting setup. Additionally, as soon as you draw into a Rayquaza you can play it down and it’s ready to go. With Lurantis GX, you first had to find a Fomantis and then find a Lurantis GX. The other big thing the deck gets is Tapu Lele GX, which helps you use niche Supporters like Brigette and Hala to get a more consistent setup. Additionally, at 170 HP, Tapu Lele GX fits in better with a tank strategy than Shaymin EX does. 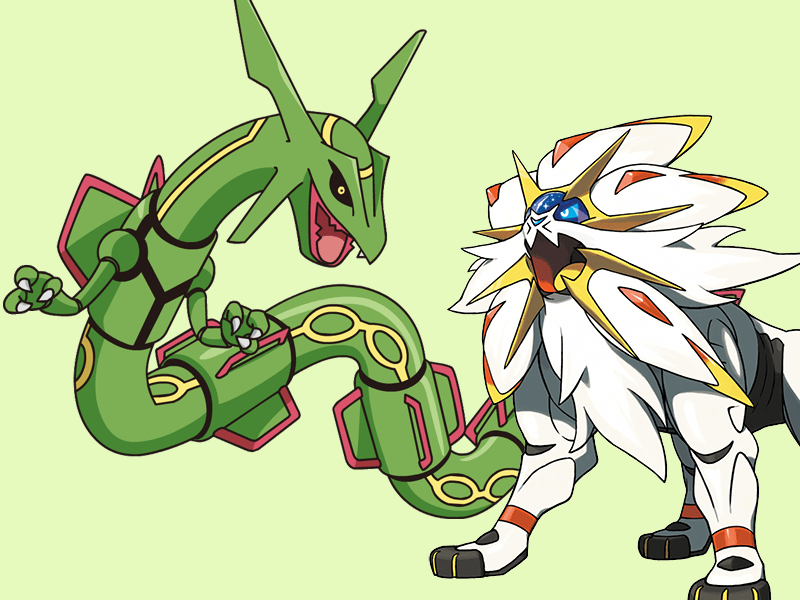 In this article, I go over my decklist for Solgaleo GX/Rayquaza and then go over how I see this deck fitting into the meta game. 4-2-4 Solgaleo GX – Solgaleo GX is the primary attacker in the deck. You will want to start the game by using its Sol Burst GX attack to accelerate Energy onto the field as soon as you get a Solgaleo GX into play. Solburst GX should make it so you have either 6 or 7 Energy on your field depending on the amount of Energy you were able to manually attach before using your Sol Burst GX. As a result, a single Sol Burst GX has the potential to set you up for using Solgaleo GX’s Sunsteel Strike for the rest of the game if you don’t whiff an attachment, assuming you’re taking knockouts against EX or GX Pokemon for two prizes each. Solgaleo GX’s Sunsteel Strike attack is one of the strongest in the game, hitting for 230 damage, which will OHKO almost everything in the game. Anything that can’t be OHKO’d can be with a Choice Band. Lastly, you will use Solgaleo GX’s Ultra Road Ability as your switch effect in the deck. This makes it very easy to immediately get off a Sol Burst GX as soon as you evolve into your first Solgaleo GX, and it also makes it so you can seamlessly switch between Solgaleo GX and Rayquaza. I like the 4-2-4 line for this card to help maximize my consistency of getting setup. 1 Solgaleo GRI – Solgaleo from Guardians Rising is another new addition to the deck that wasn’t available before. Solgaleo is a very powerful attacker, and since you already play the Cosmog and Cosmoem you can easily fit this in as a 1-of attacking option. The strength of Solgaleo is that it is a one prize attacker that doesn’t discard Energy when it attacks. The primary attack you would use it for is the awesomely named Fangs of the Sunne attack, which does 170 damage, with the effect of it not being able use Fangs of the Sunne on your next turn. This is okay though, as you can easily reset the effect with Solgaleo GX’s Ultra Road Ability and attack with it back to back. It also has a snipe attack, which can be situationally useful. You won’t use it too much because you mostly OHKO opposing Pokemon, but there are some situations where your opponent is playing low HP Pokemon, you jabbed something with a Rayquaza already and can finish it off, or right after you used Fangs of the Sunne, but you’re locked out of switching, so you have nothing better to do. 2 Rayquaza GRI – Rayquaza is a replacement for Lurantis GX from the old deck, primarily being in the deck to accelerate two Energy to a Solgaleo GX so that it can get re-powered up to use Sunsteel Strike again. However, Rayquaza can be a pretty solid attacker in its own right. With a Choice Band down, its Turbo Storm and Dragon Claw attacks combine for 170 damage, which of course is enough to knockout a 170 HP EX/GX. Dragon Claw also does 110 for a Choice Band which can be great for knocking out a Shaymin EX to end the game. 1 Drampa GX – I’ve chosen Drampa GX as a powerful Basic Pokemon attacker that doesn’t discard Energy. With 250 HP, a Solgaleo GX is very difficult to OHKO, and with Ultra Road, this deck is built for getting damaged Pokemon back to the bench. This works great in conjunction with Drampa GX, as it becomes very easy to get the damage boost on Drampa GX’s Beserk attack. With Choice Band you do 180 damage with the boost, which can knock out most Basic EX and GX Pokemon. If I get Drampa GX into play by the time I use Sol Burst GX, I typically attach 4 Metal to a pair Solgaleo GX lines and then a Metal or Double Colorless Energy (depending on if I suspect my opponent’s deck plays Special Energy removal) onto Drampa GX so that it is just a single attachment from being ready to attack. I would caution against using its Big Wheel GX attack unless you’re going to lose the game without using it, as Sol Burst GX creates such a strong board position that you should want to use it in almost every game. 2 Tapu Lele GX – Tapu Lele GX is primarily in here for its Wonder Tag Ability, which allows you to connect with your niche Supporters. It also serves as another attacking option. (Basically Tapu Lele is in here for the same reason as it is in every other deck that plays it). This deck runs fairly common 4/3 split of Professor Sycamore and N. In addition to these, the deck plays 4 VS Seeker, which lets you re-use these two most powerful Supporters along with the other Supporters in the deck. The deck only plays a single copy of Lysandre, but that is mostly fine as you can OHKO anything your opponent puts in front of you. As far as search cards go, I play 4 Ultra Ball as it can get me any of the Pokemon I need. From there, I do a 1/1 split of Level Ball and Heavy Ball. Level Ball can get you Cosmog and Cosmoem, and Heavy Ball can get you Cosmoem, Solgaleo GX, and Solgaleo GRI. These just give more outs to finding what you need. 2 Hala – The goal of the deck is to use Sol Burst GX on either the 2nd or 3rd turn of the game, so from very early in the game will you be able to use Hala for a 7 card shuffle and draw. Having such strong shuffle and draw is great in the context of a Garbodor GRI centric format as it allows us to conserve our resources while still getting strong draw, which is important, as we don’t want to recklessly discard Item cards and boost Trashalanche’s damage output. 1 Brigette – As I mentioned in my last article, the Tapu Lele GX for Brigette combo is my favorite game tactic to come out of Guardians Rising as it greatly improves the consistency of setup decks. Once again, I play it in this deck. When playing Brigette in this game, I typically use it to get 3 Cosmog, although sometimes I will get the Drampa GX or Rayquaza in the third slot depending on my prizes or what I already have on the field. This is your optimal turn 1 Supporter play. 1 Skyla – This gives you an out to either grab a Heavy Ball (or Ultra Ball) or Rare Candy to complete the combo to evolve into your Stage 2’s. With Skyla in the deck, you can take advantage of turns where you have hands that you only need the Rare Candy to evolve a Solgaleo GX that is already in your hand and there is nothing else important for you to do during that turn. 1 Olympia – Sometimes you will be locked out of using Ultra Road because of something like a Hex Maniac, and in those situations Olympia can be used to switch Pokemon to be able to attack with what you want. It can also sometimes benefit you as a healing card in some game situations. 4 Rare Candy – I can’t remember the last time I played this in a deck, but this card is back. If I was a card speculator, I would be buying out all the secret rare Rare Candy that I could, as I think that will see a big surge in price as a result of a big surge in play coming up soon. For those that don’t know what Rare Candy does because it never saw play after they started playing, it lets you evolve a Stage 2 from a Basic Pokemon in its evolution line. This used to be a staple Item that fell out of favor the past few years as the game put a heavy emphasis on Big Basic Pokemon and Item and Evolution locking. 2 Field Blower – This gives you a way to remove Tool cards from a Garbotoxin Garbodor to re-activate Ultra Road. It also lets you remove any other Tool cards your opponent has to disrupt their strategy, as well as remove Stadium Cards from play that your opponent is trying to benefit from. 1 Super Rod – There are situations where you will want to get Energy back, as well as situations where you want Pokemon back, or a mix of the two, so Super Rod is a better recovery option than Rescue Stretcher for this deck. 2 Choice Band – Despite Solgaleo GX’s Sunsteel Strike being ridiculously strong, it doesn’t actually OHKO everything in the game. In some matchups you will actually need a Choice Band to get the OHKO with Sunsteel Strike. It also gives you a way to get hit for 180 damage with Drampa GX’s Beserk attack making that a more threatening option for the deck. The deck plays 8 Basic Metal Energy and 4 Double Colorless Energy. As Rayquaza needs a Double Colorless Energy to use Turbo Storm, it’s necessary to play a high count of these for easy access. The Double Colorless also can be used to power up a Tapu Lele GX to attack and makes it easier to get Drampa GX setup. They’re even useful on Solgaleo GX as they can fulfill the Colorless part of Sunsteel Strike’s attack cost. Overall, I think Solgaleo GX fits in very solidly in the meta game. Against other EX and GX centric decks, Solgaleo GX tends to do well as it OHKO’s them, but they typically won’t OHKO you back. The deck is also very solid against Energy disruption decks such as Sylveon GX and Quad Lapras GX as you can easily OHKO these bulky Pokemon, and you have ways to get your Energy back to outlast their Energy disruption. I think the deck is a slightly unfavored against Decidueye GX/Vileplume, but in games where they struggle to get Vileplume out, you win easily, and in games where they rush out Vileplume but don’t have a good Decidueye GX setup you can win as well. Sometimes they get a good setup and lock you out of the game early and you lose, nothing you can really do about it. Greninja BREAK should win most of the time as they can lock you out of Ultra Road, which makes it difficult for the deck to function properly. Sometimes you can win with a fast Drampa GX and a clunky setup on behalf of Greninja. Gyarados is a potentially bad matchup, but you can tech against it if you expect Gyarados in your meta. I would expect Gyarados to see a sharp decrease in play after the Tapu Koko promo is released, although in Seattle it could be a bigger threat. Otherwise, the other decks it will have issue with are Volcanion EX, and random Stage 1 decks playing Flareon AOR. They hit your main attacker for Weakness causing it to get OHKO’d, there isn’t much you can do to beat fast and aggressive Fire decks. Drampa GX and Rayquaza give you outs to not being hit for Weakness, but it doesn’t matter when Volcanion EX can Steam Up and OHKO those too. I’ve found the deck to have an excellent matchup against Garbodor variants. It has lots of Shuffle and Draw, allowing you to limit the number of Items you have in the discard pile, and Solgaleo GX also resists Psychic making it even more difficult for Garbodor to take knockouts. Solgaleo GX is out of range for their Big Basics to knock you out in one hit, while you are able to easily OHKO all of their Pokemon. Solgaleo GX/Rayquaza is one of the most powerful decks in the format in terms of raw power. With the additions of Rayquaza, Tapu Lele GX, and Hala in Guardians Rising, I think this deck now has the consistency to compete. The deck is a meta call for now, and it absolutely has some bad matchups, but not every meta in this format will have the decks it’s bad against present in large numbers. In any meta with low amounts of Greninja BREAK and Fire decks, I think Solgaleo GX/Rayquaza has some very good potential to do well. From now on, at the end of each article I am going to link to image versions of the decklists that people can save onto their computers and phones for easy access. 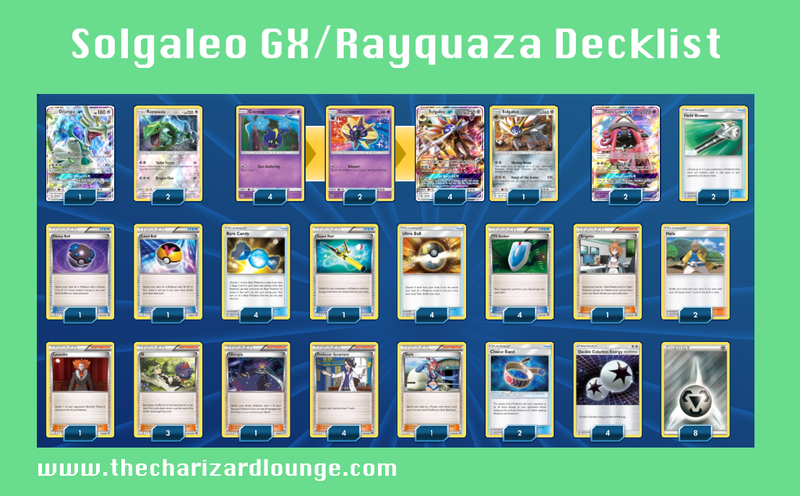 Here is the visual decklist for Solgaleo GX/Rayquaza. I have been playing this quite a bit today and I am really digging it. Fun list. Still working through some of the nuances, but slogaleo seems to make up for a lot of my misplays. Would you take this into an out of town League Cup Andrew? Or would you just play Garb? Garbodor is going to be the most meta safe, but with the format warping around Garbodor after Seattle, I would think this is fairly safe to take out now as Greninja/Decidueye/Volcanion EX (some of its rougher matchups) are on the decline, which should be good news for the deck. At out of town locals though, you’re always at risk of hitting those players that just love Volcanion or love Greninja and are constantly playing them, but the probability of that happening should decrease now with a Regional result in the books. I was curious a little more about your matchups against Garb and other single prize attackers. Even if Garb has trouble KO’ing Solgaleo GX, Solgaleo has a lot of work to do to KO single prize attackers and win the game. How do you normally work through these predicaments? In my small amount of testing it against garb thats where Lele as an attacker, Drampa, and baby Leo become all stars. In most of my garb match ups i was able to keep the item count to 7 or less, which meant he couldnt 1 shot any of them, so Id still win the prize trade. Yes, exactly what Shane said. You need to rely on Drampa and mini Solgaleo for some attacking against those decks. I think Vespiquen and Gyarados are probably among the worst matchups, especially if the Vespiquen plays Flareon. Gyarados can be ether for though. Garbodor usually has lots of EX/GX you can KO, otherwise Drampa and mini solgaleo are solid if you need something to get consecutive KO.